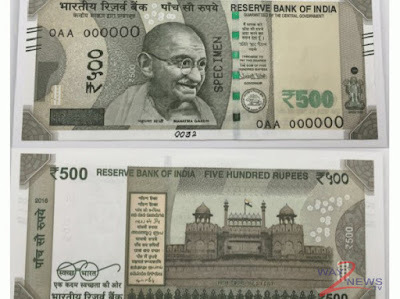 New Delhi:- After the cancellation of big banknotes, a new Rs 500 note was introduced to the bank by the Reserve Bank of India. The printing press of these notes was Rs 5000 crore spent on the central government today, the Lok Sabha said. Finance Minister P Chidambaram The matter was written in a written answer to Radhakrishnan.From December 8 to Rs 1,695.7 crore, 500 denomination notes were printed, he said. The total amount of these notes was Rs 4,968.84 crore. Similarly, the RBI printed Rs. 365.4 crore and Rs. 1,293.6 crore. The Rs 200,000 notes worth Rs 522.83 crore were spent on the Rs 2000 note and Rs. After announcing large notes, the minister told the Lok Sabha that Rs 50, 200, 500 and 2000 notes were introduced in the new design.In fact, the surplus of transfer from the RBI to the government has been reduced to Rs 35,217 crore in the year 2016-17, the main reason is the increase in printing of currency notes in another written document. In his reply, RBI had shifted Rs 65,876 crore to the government in 2015-16.On November 8, last year, the government announced a large amount of Rs 500 and Rs 1000 to withdraw the notes. After the dematerialization, RBI introduced new currency notes. The new Rs 50, 200, 500 and 2000 banknotes were introduced in the process of remediation.